Buoyed by rising stock markets and commodity prices, Africa’s billionaires are collectively wealthier than a year ago. The 23 billionaires that Forbes found in Africa – up from 21 billionaires last year — are worth a combined $75.4 billion, compared to $70 billion in January 2017. 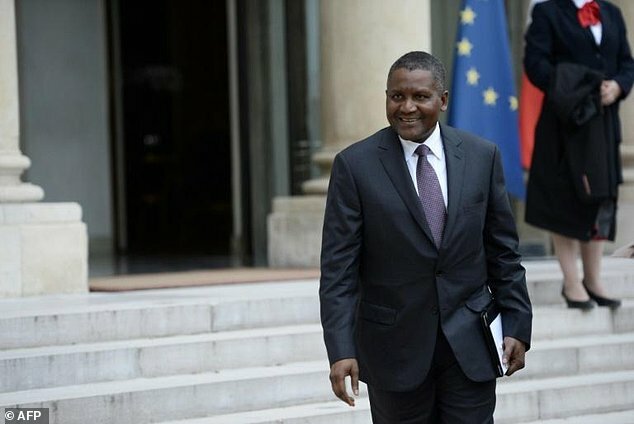 The richest African, for the seventh year in a row, is Nigerian cement and commodities tycoon Aliko Dangote, with a net worth that Forbes pegs at $12.2 billion. That’s up $100 million from a year ago. Dangote is looking beyond cement –his most valuable asset – and has been investing in a fertilizer production company and a large oil refinery. Dangote Fertilizer is expected to start operations in the second quarter this year. Number two on the list is diamond mining heir Nicky Oppenheimer of South Africa, with a net worth of $7.7 billion, up $700 million from last year. Oppenheimer is one of 8 South Africans on the list, making it the African country with the most billionaires. Zimbabwe gets its first billionaire this year: telecom magnate Strive Masiyiwa, who chairs the Econet Group. Shares of Zimbabwe-listed mobile phone network Econet Wireless Zimbabwe have surged in value over the past year; Masiyiwa owns more than half of that company. He also has a majority stake in fiber optic firm Liquid Telecom, which raised $700 million in a bond offering in July 2017. Forbes estimates Masiyiwa’s net worth at $1.7 billion. Just 2 of the 23 list members are women, unchanged from last year. Isabel dos Santos, the daughter of Angola’s longtime former president, Jose Eduardo dos Santos, is worth an estimated $2.7 billion this year, down from $3.2 billion a year ago. Her net worth dropped in part due to a lower value for Banco BCI, an Angolan bank; its book value plunged in 2016 amid a tough year for the oil producing country. The other woman is Nigeria’s Folorunsho Alakija, whose estimated $1.6 billion fortune lies in oil exploration firm Famfa Oil, which is partnered with Chevron and Petrobras on a lucrative offshore oil field. Mohammed Dewji of Tanzania is the youngest on the list, at age 42. He inherited a textile and edible oils group from his father and has expanded its operations. Forbes puts his net worth at $1.5 billion. The oldest list member is Onsi Sawiris of Egypt, age 88; he started Orascom Construction in 1950. It was nationalized by the government of Abdel Nasser and Sawiris created another construction firm from scratch. Two of his three sons are also billionaires, including Nassef Sawiris, who at $6.8 billion is Egypt’s richest man. That’s an increase from $5.3 billion a year ago thanks to upticks in the share price of several of his holdings: shoemaker Adidas, cement giant LaFargeHolcim, and fertilizer maker OCI. One person dropped off since last year’s list: Anas Sefrioui of Morocco. The share price of his homebuilder, Douja Promotion Groupe Addoha, fell about 30% in the past year, pushing his net worth down to $950 million. Fortunes rose since last year for 13 of the 23 list members, fell for 4 people and stayed the same for 3 people. The list members hail from a total of 8 countries: 8 from South Africa, 6 from Egypt, 3 from Nigeria, 2 from Morocco and one list member each from Algeria, Angola, Tanzania and Zimbabwe. See the full 2018 list of Africa’s Billionaires here. Our list tracks the wealth of African billionaires who reside in Africa or have their primary businesses there, thus excluding Sudanese-born billionaire Mo Ibrahim, who is a U.K. citizen, and billionaire London resident Mohamed Al-Fayed, an Egyptian citizen. (Strive Masiyiwa, a citizen of Zimbabwe and a London resident, appears on the list due to his expansive telecom holdings in Africa.) We calculated net worths using stock prices and currency exchange rates from the close of business on Friday, January 5, 2018. To value privately-held businesses, we couple estimates of revenues or profits with prevailing price-to-sales or price-to-earnings ratios for similar public companies. Some list members grow richer or poorer within weeks –or days — of our measurement date.